Kapidamu Band of Atimon, Quezon is back in the competition. 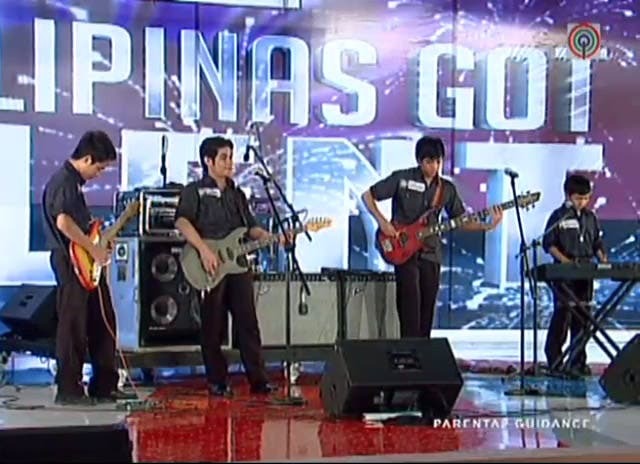 They did not make it to the grand finals last year, but “Pilipinas Got Talent” season one semi-finalist Kapidamu Band of Atimonan, Quezon is back for another shot at winning in the biggest and number one talent-reality show in the country. Judges Kris Aquino, Ai Ai Delas Alas, and Freddie M. Garcia were surprised to see them back on stage but were even more surprised to see how much they have improved as a band. Will Kapidamu Band make it to the grand finals and win? PGT continues to dominate weekend programming nationwide. Last Saturday, PGT scored a national TV rating of 31.9% versus rival shows “Kapuso Mo Jessica Soho” (20.4%) and “Talentadong Pinoy” (7.1%). It also ruled last Sunday when the show rated at 31.4% nationally versus “Mel & Joey” (13.2%%), according to Kantar Media/TNS. Keep watching “Pilipinas Got Talent” with Billy Crawford and Luis Manzano airing every Saturday and Sunday, 8:45 PM on ABS-CBN. hahaha malamang may topak nga yan! lahat na lng ata ng article sa site na to my comments yan eh.. copy and paste nga lng hahaha. anyway,gudluck kapidamu i hope u’ll make it this time..
ANUMANG MAKATAPAT NG PGT-NAILALAMPASO NITO SA RATINGS.CONGRATS. Cheating & Data Tampering, Desperate Publicity, Mind Conditioning, Mislead Info’s, Rating Manipulations, etc. Pag d gawang gma, minsan nag re-rate. Boboserye, Flopserye, Peryaserye, Pornoserye, O.A.serye, T.H.serye, etc. Practice Acting – tatak gma. gma is afraid of getting involve into politics. that’s why they tend to engage in “barangay” matters.